This IBM® Redbooks® publication is written as part of the deployment guide series. 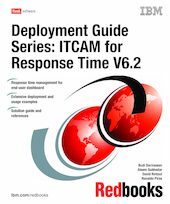 This book provides a step-by-step guide for deploying ITCAM for Response Time V6.2. This deployment guide can help an IBM or business partner service person plan and perform the deployment of the product. The discussion of ITCAM for Response Time includes the explanation of product architecture and its components. We discuss planning and sizing considerations before you implement the product and some guidelines on setting up service engagement for the product. The deployment explained in the book would fit for a demonstration or a small deployment system, although the information is highly relevant for larger deployment engagements. This book also explains some usage scenario that can be performed for demonstrating the product.